Veteran Caroline brings her Coast Guard expertise to the branch. Here at Citizens, we are proud to recognize the accomplishments of our veterans. We also recognize the extraordinary skills and unique perspective that they bring to their careers outside of the military. 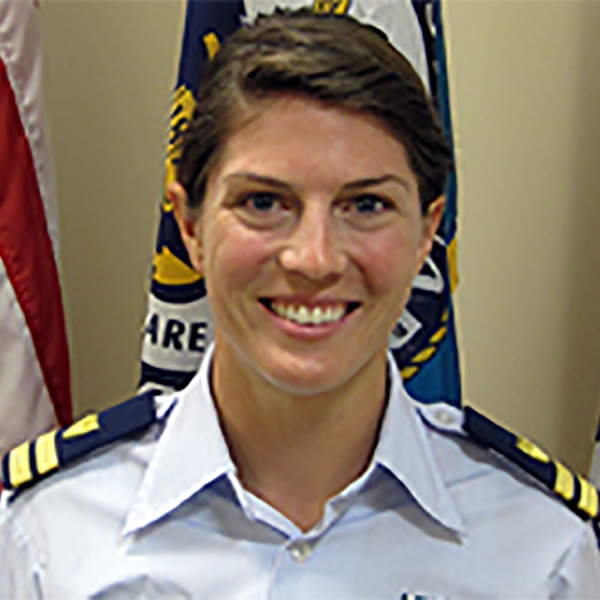 We sat down with our colleague Caroline to talk about her time in the Coast Guard, how she transitioned from the military into the civilian workforce and advice she has for veterans looking to embark on a new career path. Please explain your role here at the bank and why you came to Citizens. I work as a Branch Manager for the Citizens Branch in Hingham, MA. I attended the Service Academy Career Conference in Washington, D.C. in May where I met with recruiters from Citizens. After talking with them for some time, I was struck by how aligned my own values were with those of Citizens. We both value integrity, hard work and putting others first. I got the chance to interview shortly after the conference and Citizens was incredibly responsive during the whole process; I really had a great candidate experience. What part of the military did you serve in and how long? I graduated from the United States Coast Guard Academy in 2012. From there my first assignment was in Texas as the Operations Officer aboard the USCGC DAUNTLESS. Our crew conducted law enforcement missions including counter-narcotic and human trafficking interdictions, as well as several search and rescue operations. From there I became the Executive Officer on the USCGC SANIBEL in Massachusetts, where we conducted fisheries enforcement, recreational boating safety, and search and rescue missions. My final year in the Coast Guard I worked as an admissions officer and also helped coach the women’s rugby team at the Academy. I was raised in a very patriotic family and was also fortunate enough to travel quite a bit in high school to other countries. I realized how fortunate I am to have been born and raised here in the United States, and truly appreciate the great country we live in. I wanted to give back to the people who came before us to make this country what it is, and to continue making it better for the future. To be honest, the hardest part is dressing myself each day in something that is not my uniform! Citizens has made the transition easier through the support they have given me. I have gone through numerous training sessions and my colleagues have been very understanding and patient. Going into a business mindset has been a little challenging but I realize I do have the abilities necessary to meet the challenge. I have always valued helping others grow and coaching them along, and as a branch manager I will get to encourage my colleagues and support them in their goals. Knowing I will be able to make an impact in this way has really helped my transition. Are there any skills you developed in the military that you think will translate into the workplace? Plenty! In both of my roles on ships with the Coast Guard I was responsible for planning and logistics, which often involved delegating tasks to those around me. In the branch manager role I will do the same thing but in a different context. I will help define the goals of my team, figure out the best way to reach those goals, and work with the team to accomplish those goals together. Running operational procedures is something that I am very accustomed to from my time in the Coast Guard, and I am excited to bring a unique experience to Citizens. What advice do you have for veterans looking to head back to work? Put yourself out there and do NOT downplay your experience and your accomplishments in the military. Even if your time in the military seemed routine, you must realize that your experience gives you a unique perspective. You have translatable skills, you are important and you are hirable, so be confident and embrace it! Interested in joining a diverse, dynamic workforce? Learn more about the numerous career paths we offer.